This FREE eBook is brimming with Thanksgiving craft projects and recipes to make your Thanksgiving dinner celebration a hit! By: Craft Marketing Connections. Inc.
Have your house nicely decorating for Thanksgiving this year while having the house smell nice and fresh. This turkey is not only a centerpiece, but also serves as an air freshener. 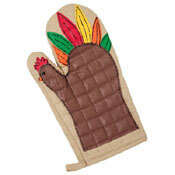 You will love having this cute little turkey as an extra Thanksgiving decoration to make your guests smile. Nobody can resist the charm of a turkey, and it's scent is even more irresistible. Capture both in this Thanksgiving craft that will get the whole family smiling and smelling good. Paint pot tan; let dry. Apply second coat; let dry. Moisten sea sponge; squeeze to remove excess water. Sponge paint pot. To sponge paint, dip sponge into paint, press sponge onto paper plate to remove excess, and then apply to surface with up-and-down motion. Let dry. Sponge paint pot sage green in same way; let dry. Open air freshener and place in pot. Wax serrated knife with candle stub or paraffin. Cut 2-1/4"-diameter circle from bottom of 4" foam ball; discard scrap. Use spoon to carve out foam from inside ball, until it fits over top of air freshener. Cut small foam ball in half; reserve one half for a future project. Cut 1-1/2"-diameter circle from one rounded side of 4" ball, 3/4" above flat bottom edge. Use glue gun to glue half-ball to flat area for head. Replace head/body over air freshener. Trim foam at bottom of head if needed until head fits in pot. For feather placement, cut a 1/4"-deep groove across center top of body, beginning and ending 1-3/4" from flat bottom edge. Remove turkey from pot and paint brown; let dry. Apply second coat; let dry. Paint medium teardrops yellow; let dry. Measure and use craft snip to cut 1-1/8" from pointed end of each teardrop. Cut small slit in head for beak placement. Glue teardrop ends into slit as shown, 1/4" apart. Glue bead eyes to head. Cut two 1" x 3" strips from burgundy paper for wattle; glue strips white sides together. When dry, cut wattle pattern from glued paper. Glue wattle under beak, gently curving to add dimension. Measure and use craft snip to cut 2-3/8" from pointed end of each extra-large teardrop. Use white glue or optional glue stick to glue wooden "feathers" to unprinted side of desired papers; let dry. Trim excess. Glue paper to back of feathers in same way, if desired. Use glue gun to glue cut feather ends into slit in body; let dry. Replace turkey over air freshener. Use compass or circle template to cut 4" circle from cardboard. Glue back edge of pot to back edge of circle. Arrange and glue leaves, acorns, nuts, and berries to cardboard. To make this free craft pattern, we recommend the following materials. You can find them for a discount at CutRateCrafts.com! If you are looking for more turkey crafts, these 16 Turkey Crafts for Thanksgiving are a great way to celebrate the holiday. A very cute idea and clever! Would not have thought of a turkey as an air freshener! An alternative to store bought freshener, is to use a pomander of cloves, cinnamon, lavender, or other natural scents or oils! Better for the lungs, and you cans suit the scent to your own favorites! I love this idea. 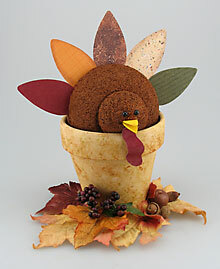 I can make place holders with mini-turkeys - 2 inch clay pots and makes cute gift for guests to take home with them. I'm going to look for some real feathers to use, too.